The successor to the Huawei Ascend P7, the company's last flagship to bear the Ascend name, has popped up in some live images. 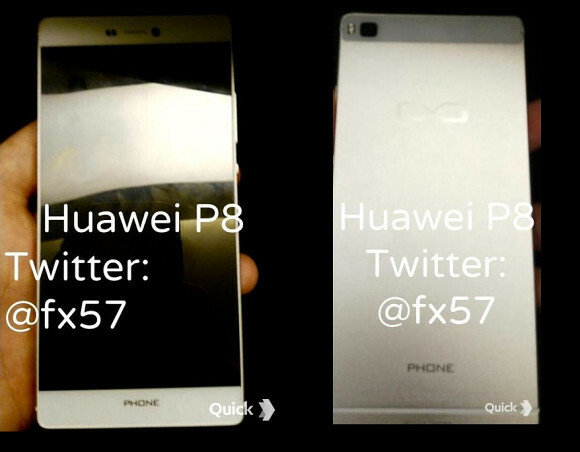 What will likely be the Huawei P8 is revealed to the public, front and back. It follows the design language of the predecessor with sharp edges and slightly rounded corners. Side bezels have been kept to a minimum, the top one is also quite compact. The camera/flash arrangement on the back differs a bit from the cutouts shown in a previous leak, but perhaps that was an early design that was abandoned later on. Hardware specs have been revealed by the same source, and they are very much in line with what we already know. The device will reportedly come with a 5.2-inch display of 1080p resolution, in-house Kirin 930 64-bit chipset and 3GB of RAM. On-board storage wasn't specified, though. The source reports that the main camera will be a 13MP unit with optical stabilization, which is the next must-have feature in phone cameras. Battery capacity will be 2,600mAh, and that might raise some eyebrows. Given, however, the stance of Huawei CEO on QHD displays and battery efficiency, the P8 may be appropriately equipped. The device will boot the latest Android Lollipop upon launch. Official announcement is expected to take place at a dedicated event some time in Q2 2015.